GREENBELT, Maryland, March 20, 2011 (ENS) – To probe the state of ice sheets, glaciers and sea ice near the North Pole, NASA is flying a specially equipped plane out of the U.S. armed forces’ northernmost installation, the Thule Air Base in Greenland, 750 miles north of the Arctic Circle. The flights are part of Operation IceBridge, a six-year mission that NASA says is the largest airborne survey of Earth’s polar ice ever flown. Since 2009, Operation IceBridge has flown annual campaigns over the Arctic starting in March and over Antarctica starting in October for multi-instrument views of the rapidly changing ice features. The mission is yielding an unprecedented three-dimensional view of ice sheets, ice shelves and sea ice at both poles that the space agency says are important indicators of climate change. NASA scientists say Operation IceBridge will bridge the gap in polar observations between NASA’s Ice, Cloud and Land Elevation Satellite, ICESat, which collected data fkrom 2003 to 2009, and ICESat-2, planned for late 2015. “Understanding the change happening in the Arctic is very important because the poles serve as harbingers for the Earth’s climate system. Basically this means that the poles give insight into what changes will happen around the world before any other place on earth,” wrote First Class Midshipmen Eric Brugler, an honors Oceanography major at the United States Naval Academy, in the mission’s blog. On March 16, instrument teams and crew flew the campaign’s first science flight aboard the P-3B, a specialized four-engine turboprop plane capable of long duration flights up to 12 hours, large payloads up to 15,000 pounds and altitudes to 30,000 feet. The airborne remote sensing measurements sampled sea ice from low (1,500 feet) to high (17,500 feet) altitudes, and along ground tracks of the European Space Agency’s Earth-observing Envisat satellite. The campaign’s second flight on March 17 flew near the border of Russian airspace. The aircraft collected measurements as the European Space Agency’s ice-observing satellite, CryoSat-2, passed overhead. On March 18, the P-3 crew sampled the thick multi-year ice north of Ellesmere Island, and the gradient to thinner ice toward the pole. 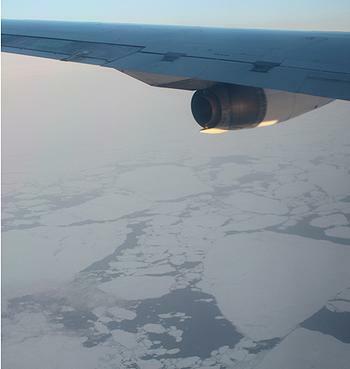 Among the highest priority flights is an overnight transit to Fairbanks, Alaska, to collect sea ice thickness data across a slice of the Arctic Ocean. Sea ice is thought to be thinning in recent years in addition to shrinking in the area covered. Another high-priority flight plan is over the Barnes and Devon ice caps of the Canadian Arctic Archipelago. “The Canadian ice caps are notably smaller than the Greenland and Antarctic ice sheets, but are still significant potential contributors to sea-level change in the next few decades,” said Charles Webb, deputy cryosphere program manager at NASA’s Goddard Space Flight Center in Greenbelt, Maryland. “They also serve as potential early-warning indicators, responding more sensitively to temperature changes than the more massive ice sheets,” Webb said. Other IceBridge missions will retrace paths flown in previous years, such as flights over Petermann, Jacobshavn, Kangerlussuak and Helheim glaciers – the outlets through which Greenland loses mass from its ice sheet. With this multi-year data, scientists can begin to see how such glaciers are changing, where ice loss is slowing or accelerating, and why.